On the site’s About page I briefly mention the secret underground biker-haven inToronto that the site is run from. Barred windows, heavy locked doors, a two car garage with surround speaker system, a big flat screen TV inside, a collection of motorcycle parts in the kitchen, and a built in bar that lights up like a Christmas tree, this is what I call home. Unfortunately, the landlords are selling and it’s time to once again pack up my saddlebags and find a new biker-bunker, and so I discover a new downside of being a motorcyclist in the City of Toronto. The reality is, if you’ve been riding a motorcycle in Toronto for a few years and have been attending the local motorcycle meetings, trade shows, or other events in the riding community, we probably know each other. At the very least, we’ve probably seen each other. The Toronto motorcycle community is very small, and tight knit. There aren’t many of us, but we’re loud, and proud. People know we’re out there, and clothesline us all the same. Most homes in Toronto(and I mean the real Toronto, not the GTA), are around a century old. Parking is a problem in the inner city. Garages are harder to find than one might expect, and they sure aren’t available for rent. To make matters worse, that bold motorcycle pride I mentioned earlier can hurts us: I’ve had potential new landlords flat out tell me they weren’t interested in renting to someone who owns a couple motorcycles. What does that say about our image? So that leaves the option of underground parking and living in an apartment or condo building. It’s a well known fact in the city that sportbike (supersport) motorcycle thefts run rampant in these underground parking lots. What’s a motorcyclist to do when he suddenly finds himself kicked out the bike-cave with nowhere to go? I still can’t complain about being a motorcyclist in Toronto though. It’s my passion and I’ve found a way to make a living out of it. Parking is free. The beautiful women of Toronto appreciate these beautiful machines, and I’ve even managed to find one that rides her own. What’s not to love? Our trade shows lack the flavour ofMontreal’s and the grandiose bravado ofMilan’s, but they have their own homely and predictable feel and for whatever reason we keep on going back. So yes, Toronto is a small spec in North American motorcycling but beyond any conceivable doubt, Toronto motorcyclists are world class. We can ride, party and rock with the best of them, and we practice all three religiously. Yes our scene is small, but we’re out there riding, day in and day out, whether through Tropical Summers or Arctic Winters. 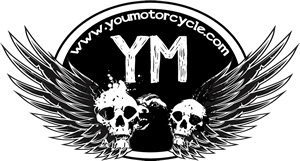 I’ve already posted about the weekly Toronto motorcycle meets, so this off-season I’ll be highlighting some of the people, places, and events that make motorcycling in Toronto something to be proud of. Shiny sides up, boys and girls!